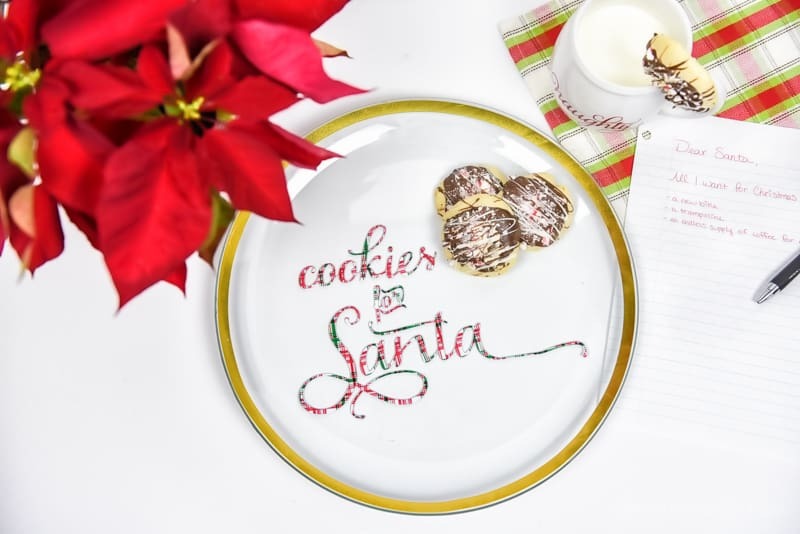 Give a unique look to a common craft and use patterned vinyl on a Vinyl Cookies for Santa plate! One of my favorite things to do during the Christmas holiday is to turn on my favorite tunes and bake some holiday goodies. My younger sister used to come over and we’d spend the day in the kitchen eating way too much cookie dough, baking and singing along to our favorite songs. It’s a tradition we’ve continued now that we’re older and it is most definitely one of my favorites! Years ago, when we were younger, I remember baking with my dad and sneaking raw cookie dough when we thought he wasn’t looking (we always got caught)! I have always wanted to make memories like those with my own kids, and now that I have a toddler those dreams are finally becoming a reality! He’s still too young to fully grasp what is going on but even so I’ve decided to get ahead and start a few foodie traditions now, even though he won’t “get” it for a few more years! And the one tradition I’m really excited about is the Vinyl Cookies for Santa Plate! Food is a huge part of the holiday for me (I mean, isn’t it for everyone?) and I love being in the kitchen and making delicious treats for family and friends. I’ve never been a huge cook or an amazing baker but as I’ve gotten older I’ve definitely gotten better. This weekend I decided to try peppermint bark cookies and they are so good. So good in fact, that I sent the majority of them into work with Chris because I knew I wouldn’t be able to control myself if they were in the house. I know that once my little boy gets old enough to help me we’ll make cut-out sugar cookies to put on the vinyl cookies for Santa plate, but since he won’t be eating these I decided to make something more decadent that Chris and I would really enjoy! And they looked really good on the plate, so that was a huge bonus! Want to make your own Vinyl Cookies for Santa Plate? It’s easy! + Type out your saying in the Silhouette Software. Send it to your Silhouette and cut it out. 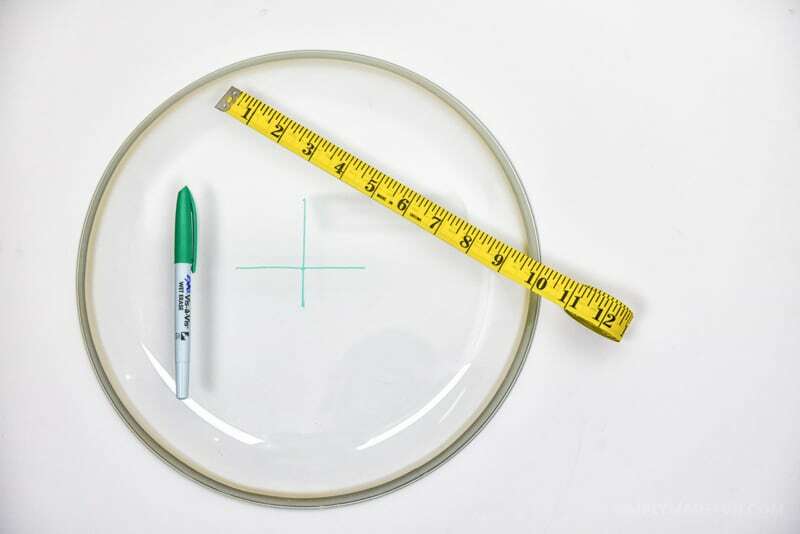 + Use a ruler and find the middle of your plate. I marked the spot with a dry erase marker so that I could line my design up properly. + Put transfer paper on top of your vinyl and peel the saying off of the vinyl backing. Then lay the vinyl on the plate and rub the saying with a pen or one of your vinyl tools. + Lift up the transfer paper and then use soap and water to wash off the dry erase marker. One thing you have to be careful of is to NOT place your food on top of the vinyl, it’s toxic. If you’re going to load the vinyl cookies for Santa plate down with food, use a doily or parchment paper underneath whatever you’re going to eat. I know the plate is cute, but you also want to be safe! 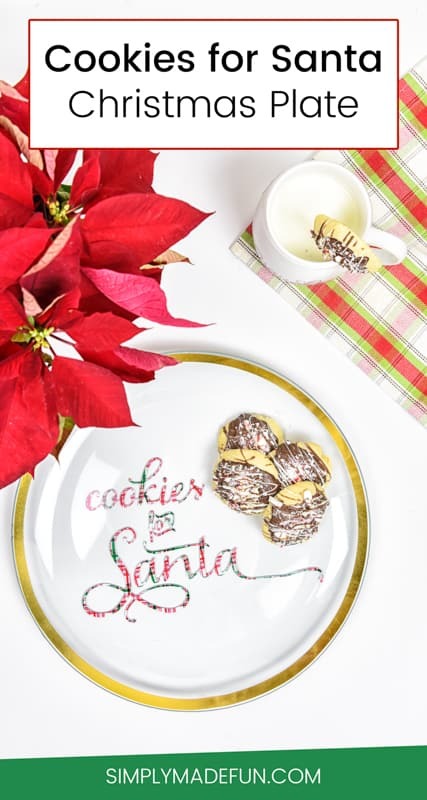 I’m really excited to use this Santa plate for years to come and I can’t wait to try all different types of cookie recipes to pair with it. Emily made these Christmas Funfetti Cookies (which are my favorite type of cookies!) that I’m dying to make and display on the plate! What type of cookies would you put on the vinyl cookies for Santa plate? Want more holiday craft projects? I love how cute this plate is and I especially love the patterned vinyl, it is so fun! I will have to make one of these for next year when K will understand a little more about Santa! great idea! I love vinyl this is perfect I would love to make one for this Christmas.